When Asaf Rustamov (pronounced AH-saf ru-STAM-ov) was a young boy, they didn't have television or even radio, so he loved reading books. 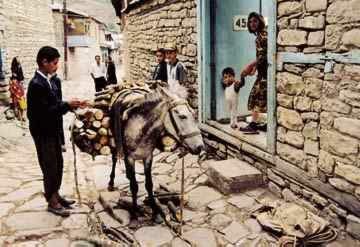 But one day an order came to burn all of the books in his village. Asaf never forgot that day even though it happened 70 years ago. Photo: In the village of Lahij high in the Caucasus mountains today. Courtesy: BP. The problem was that the books in his village were written in an alphabet that the new leaders in Asaf's country didn't like. The books were written in Arabic script, an alphabet that had been used in that region for more than 1,200 years. Imagine having to start over and learn a new set of ABCs and forget the old ones! And what if your favorite books were burned just because they were in the old alphabet that some people thought was "wrong"? It was July 1928. Summer holidays. I was 10 years old and had just finished 5th grade. We lived in Lahij (pronounced lah-HEEJ), a village high up in the Caucasus Mountains in Azerbaijan. 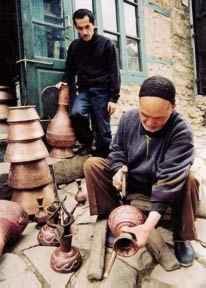 Photo: Making copperware is a traditional craft in the village of Lahij. Courtesy: BP. Even today, it's difficult to travel the mountain roads to reach Lahij. In winter months when it rains or snows a lot, it's too dangerous to drive, even with a jeep or a four-wheel-drive vehicle. The narrow dirt road hugs the side of the mountain. You have to be careful not to get too close to the outer edge, which drops straight down to a river far, far below. There are no guardrails on the road to keep you from driving right off the side of the mountain. As a child, I remember how excited we used to be when visitors came to our village. One day I was sitting on our balcony when suddenly I saw seven men galloping up on horses. No one knew what they wanted. We learned that they were government leaders. They told us to gather at the village square because they had something to tell us. "Everybody bring your books and dump them in a big pile in the middle of the village. Bring all your books from your homes. Don't hide a single one of them. If you do and we find out, we'll put you in jail. Bring all your books by 5 o'clock today. Then we'll make a big fire and burn them." We couldn't believe his words. What? Burn our books?! But we loved our books. Why burn them? Azerbaijan was not free like it is today. The new government that ruled over us wanted us to read books that were written with a new alphabet. They didn't want us to read the Arabic alphabet anymore because our Holy book, the Koran, was written in it. The Koran is for Muslims like the Bible is for Christians or the Torah for Jews. The government didn't want us to read the Koran and practice our religion anymore. They didn't want us to believe in God anymore. But other books were printed in Arabic as well-not just the Koran. We had used the Arabic alphabet for 1,200 years. We had poetry books, literature books, science booksbut it didn't seem to matter-we had to burn them all. The people were afraid to disobey. With tears in their eyes, they brought their books to the center of the village and put them on a pile that grew so high that it could have filled two trucks. There were more than a thousand books. I couldn't understand why anyone would want to burn our books. We lived so far away from any stores so we couldn't get new ones easily. We didn't have TV. We didn't have radio. We needed our books to learn things. What would we do without them? Although it was risky to hide any books, I found out later that some people buried their books so they could read them in the future. This terrible tragedy took place when Joseph Stalin was the leader of our country. Stalin ruled our country from 1924 until 1953, when he died. Most people think he was one of the cruelest rulers of the century. When he became the leader of the Soviet Union, he did his best to make people stop believing in God. He even dynamited huge mosques and churches so people would not be able to worship together. If Stalin and his followers didn't like someone, they would send him to a prison far, far away from his home. Often, that person was never heard from again. People were afraid. No one knows exactly how many millions of people died this way. Later I learned that it wasn't just our village where the Arabic books had been burned. It happened throughout Azerbaijan and also in nearby republics such as Kazakhstan, Turkmenistan, Uzbekistan, Tajikistan and Kyrgyzstan, wherever there were books written in the Arabic alphabet. It's a terrible thing to burn a book-it's like murdering children along with their future children, grandchildren and great-grandchildren. Burning books means that all of the knowledge that grownups discovered and wrote down is lost and cannot be passed down to future generations. Kids have to start all over again. It's an enormous tragedy! I was a soldier in World War II. When I came back to Azerbaijan, we were having a really hard time in our country. People were hungry and couldn't find jobs, so they began selling some of the old books that they had hidden earlier. Since I loved books and could read the Arabic writing, I bought as many as I could find. This happened around 1949. My favorites were very rare books about medicine that were hundreds of years old. I had an old handwritten copy of a book by Avicenna, who was one of the first doctors in the world to write down his ideas about medicine (11th century). At that time, the Arabic alphabet was used in all of the surrounding countries. After I started collecting these books, I ran into trouble. An old friend of mine told me that the secret police-the KGB-was watching me. The KGB used to spy on people to find out if they were doing anything that the government didn't like. "They're watching your house. You can't take the books away. You'd better burn them, or else someone will come after you," my friend told me. And so again, for the second time in my life, I had to burn the things that I loved the most-my books. All those rare medical books that I had found and bought one by one had to be destroyed. I had no choice. Either I had to burn my books or go to prison or be killed. So my wife and I burned those precious books in the fireplace. We were so sad. The tears rolled down our faces as we watched the flames eat up our precious books. that were used for making medicine. People knew how to take the leaves, stalks, flowers, roots and seeds and use them to treat specific diseases. Today we only know of about 50 plants growing in our country that can be used to heal people when they get sick. I don't think we will ever recover the knowledge from those books that were burned so long ago. It was a terrible crime and many generations will suffer for years and years to come. Betty Blair, Editor of Azerbaijan International, inter-viewed Asaf Rustamov (1918-1997) in 1995 in relation to his work on the history of herbal medicine in Azerbaijan. Aynur Hajiyeva, Marjan Abadi and Jala Garibova also contributed to this article.